Unfortunately, you can not swim with dolphins Florida Tampa Bay because there no dolphin facilities there. The closest dolphin facility where you can do this is in Orlando, which is 1 hour away. This is at Discovery Cove. This program is very popular and sells out quickly. Usually you have to book months in advance. If you book early, Discover Cove is a great option for our Tampa Bay area guests. 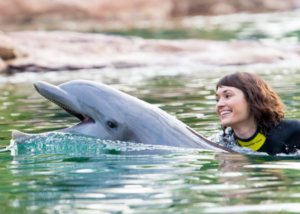 This program is a lot of fun because you will get swim with dolphins Orlando program plus a full day of activities at the park, snorkeling, swimming, beach, breakfast and lunch buffet and so much more. Also, you will get unlimited entrance to Sea World and Aquatica for 14 days before or after you dolphin program, a great value. 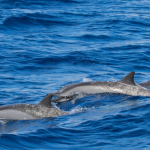 Your next best option would be the swim with dolphins St Augustine Florida, which is about 3 hours away by car. I know this may sound far but it might be a great day trip to the oldest city in the United States, started in the late 1500’s. St Augustine is on the East Coast of Florida, just North of Daytona Beach. It’s an easy drive across I-4 east to I-95 North and you will be in St Augustine in no time. The program in St Augustine is amazing because the facility is right on the Ocean and spending time with the dolphins here is breath taking. This program here is only dolphins and nothing else. So you can get in and out quickly if you like or hang with the dolphins and the beach. Also, we realize many of you that come to Tampa Bay drive down from the Mid-West, Chicago and Michigan area. That means you come down I-75. You may want to consider the dolphin program we offer in the Florida Panhandle, the swim with dolphins Panama City Beach program. This program includes the dolphin program and dolphin, sea lion, and marine park shows, our best value in Florida. It may on your way down or back home to the Mid-West. But if you want to try for the Orlando Dolphin swim program, click the yellow button below to see if there is space for you and your family. The Orlando program is 2 full days of activities, so keep that in mind if you want to book this. The Orlando program is a day of up-close encounters with bottlenose dolphins, an exclusive, reservations-only tropical paradise offering once-in-a-lifetime animal adventures. During a daylong visit, you will have the rare opportunity to swim and play with bottlenose dolphins, snorkel in a coral reef with thousands of tropical fish and rays, hand-feed exotic birds, and feast on delightful food. Your all-inclusive package includes unlimited access to every attraction at Discovery Cove, with all of your gear, meals, and drinks included, plus, a second full day pass at Sea World Orlando or Busch Gardens Africa Tampa. You don’t have to be a Marine Biologist or have to study Animal Sciences to enjoy these great animals. We have just the program for you in three different location, Orlando, St Augustine, and Panama City Beach! We offer Full Day, 1/2 Day, and few hour Dolphin programs. The Full Day and 1/2 Day programs include other activities and shows.